Best Places to Spray - Around neck, inside elbow areas. Scrunch neck and elbows to intensify dirty wrinkle look. REEL CREATIONS now offers this NEW palette, adding more colors for you to create ghouls, monsters and other morbid effects. 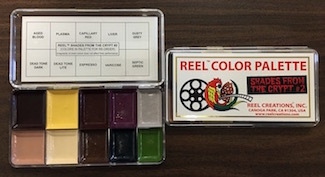 All colors in this palette are also available in the REEL Body Art Inks.